Be the first to share your favorite memory, photo or story of Leroy. This memorial page is dedicated for family, friends and future generations to celebrate the life of their loved one. 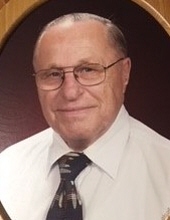 Leroy W. R. Mahloch “Whitey” passed away peacefully in hospice care at Kindred Hearts on Saturday, January 26, 2019 at age 93. Loving father of Deborah (Michael) Mahloch-Dempsey and fun-loving Grandpa of Joseph Dempsey and Samantha (James) Braun. Further survived by Beverly Mahloch; sister, Janet Holzer, nieces, nephews, extended family and dear friends, especially Bill and Linda Smith, JoAnn Rose, Mick Even, and the St. Nick lunch group. Proceeded in death by parents, John and Selma Mahloch, sisters Delores (Harold) Mais and Ruth (Vernon) Herber. Whitey was born in Quarry, WI on December 1, 1925 to the late John and Selma (Raschke) Mahloch. Whitey proudly served his country in World War II enlisting in the Navy at age 17. Upon returning from service, he left Sheboygan and settled in Milwaukee for the next 30 years. His passion was the restaurant business, first working at ACE Foods, then Flemings A&W and then returning to ACE Foods as manager. After 11 years at ACE, he bought and operated the Caswell Coffee Shop and adjoining bar in downtown Milwaukee. In 1976, he left Milwaukee and bought Arndt's Restaurant in Plymouth, which he operated for the next 14 years. During these years he also had the "Sheboygan" Brat-Wurst Stand at the Wisconsin State Fair. Whitey enjoyed fishing and had a great love for his dogs. Teasing the ones he loved with his sassy wit is something he will always be remembered for. The family would like to thank the staff at Kindred Hearts and the Aurora Hospice for their kind and loving care provided to Whitey. He remained strong and stubborn to his last day. A special thanks to the many family and friends who visited him on a regular basis. Also, thank you to Tracy and Lucy for lifting his spirits during their numerous visits. The Celebration of Life will be held on Saturday, February 2, 2019 from 10:00 until the Memorial Service at NOON at Ballhorn Chapels Funeral & Cremation Care Center, 1201 N. 8th St. in Sheboygan. A private inurnment will take place at a later date. In lieu of flowers, memorials to the Sheboygan Humane Society or the VFW Post 5612 in Plymouth are appreciated. To send flowers or a remembrance gift to the family of Leroy W. Mahloch, please visit our Tribute Store. "Email Address" would like to share the life celebration of Leroy W. Mahloch. Click on the "link" to go to share a favorite memory or leave a condolence message for the family.